I have been back at work for few weeks now. No extended summer holidays in my current role. My work this month has involved reviewing our reporting solution in light of recent changes, as well as supporting schools with their start of the year setup. With the move from ten weeks of holidays to four, I have learnt to appreciate every minute. Whether it be going away for a few days to explore Bendigo or building endless flat pack furniture, my time was occupied. Looking back at my few weeks at home, we managed to get so much done, even in the insipid hot and humid weather. Personally, I have spent the month head down in the world of the #IndieWeb. 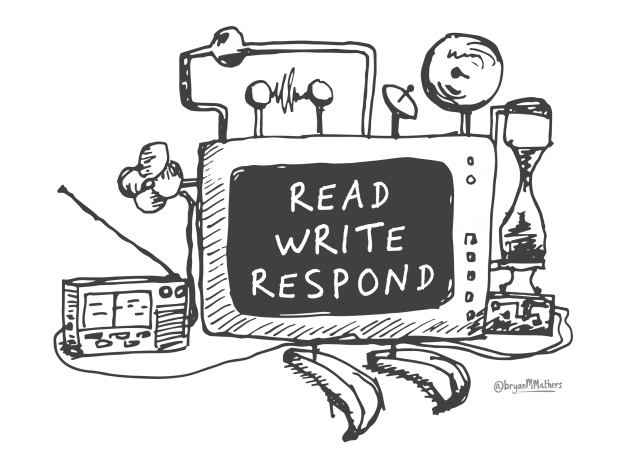 In particular, I have continued to craft my second space: collect.readwriterespond.com. This effort to better control my existence on the web fits with my focus of ‘intent’ this year. I sometimes find myself using the word deliberate, but it all feels far too adhoc for that. With all this in mind, I contributed to a collective podcast that Benjamin Doxtdator put together. I also got to catch up with Richard Olsen for lunch, which was nice as well. Read Write Review – Voices from the Village in 2017 – A curation of my year and keeping a monthly newsletter. My One Word for 2018 is Intent – My ‘one word’ for 2018 is intent. For me, this is about many things. Reflecting on the Voices in the Village 2017 – A collection of comments from my blog(s) that have pushed my thinking this year. Reclaiming My Bookmarks – A reflection on using my own blog to reclaim my bookmarks and then syndicate them to other sites, such as Twitter and Diigo. A Kind of Emoji – A reflection on using emojis as a way to provide visual information about blog posts. Microcast #005 – A Day in the Life of a Blogger – A recorded response to Richard Byrne on blogging, which he kindly responded to. 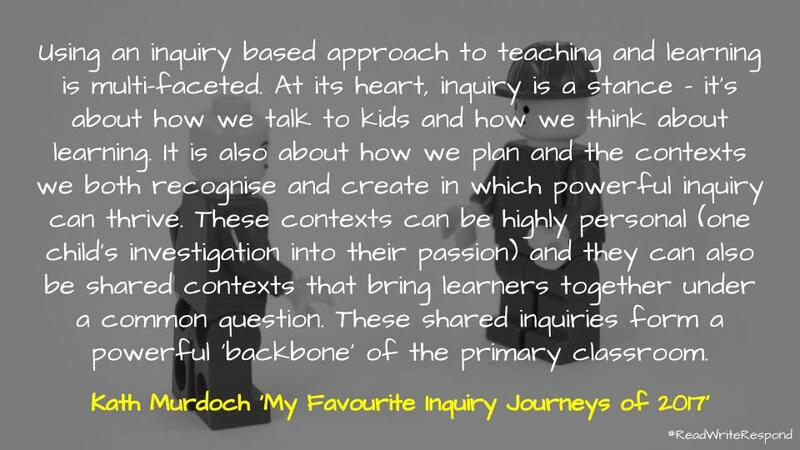 My Favourite Inquiry Journeys of 2017…. 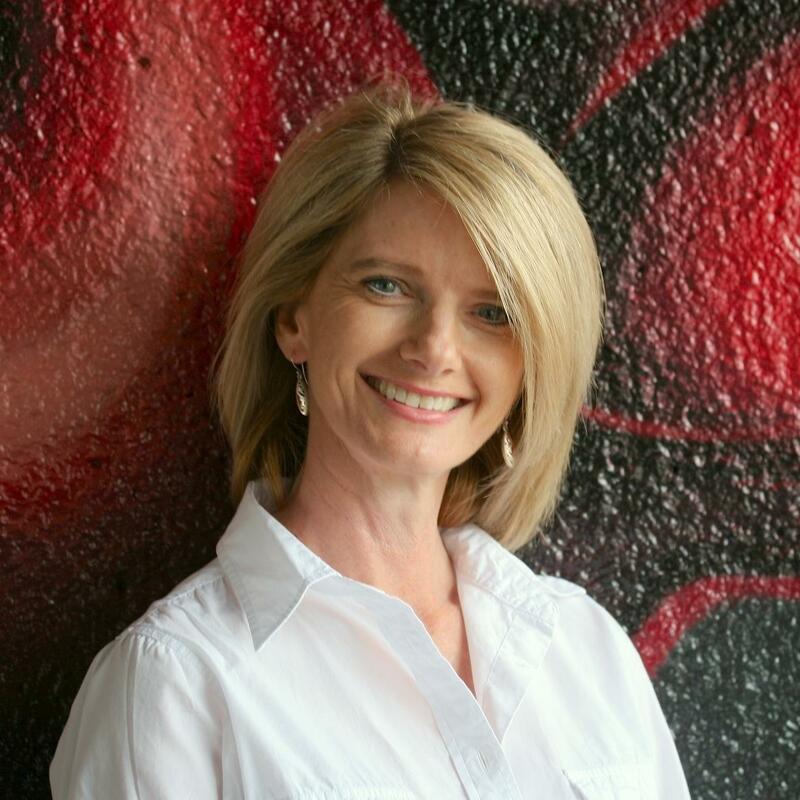 – Kath Murdoch stops and reflects on twelve projects she has helped with in 2017. In summary, she pulls out some of the key aspects that went across all the different inquiries, such as authenticity, integrative, involves experts, learning is shared and emergent. This post is not necessarily a list of driving questions and/or units to roll out, but rather a source of ideas and inspiration. Along with her post on ten practices of an inquiry teacher and AJ Juliani’s reflection on choice-based learning, they provide some guidance going into the new year. Google Maps Moat – Justin O’Beirne discusses the addition of ‘areas of interests’ to Google Maps. He wonders if others, such as Apple, can possibly keep up? The challenge is that these AOIs are not collected — rather they are created. Added to this, Apple appears to be missing the ingredients to develop their own AOIs to the same quality, coverage, and scale as Google. Google is in fact making data out of data. For a different take on Google 3D imagery, watch this video from the Nat and Friends. Google’s buildings are byproducts of its Satellite/Aerial imagery. And some of Google’s places are byproducts of its Street View imagery. So this makes AOIs a byproduct of byproducts. Google is creating data out of data. Four Moves – Mike Caulfield has released a new site containing a series of activities to support the development of web literacy and fact checking. It focuses on the four moves: check for previous work, go upstream to the source, read laterally and circle back. The Four Moves blog is based on research conducted by Sam Wineburg and Sarah McGrew, which found that students lack knowledge of basic web techniques for verification and source assessment, which puts them at the mercy of misinformation. Instructions are written for students using the Chrome browser due to the popularity of that platform in schools and among students. However, the features we are using are in general not browser-specific; faculty and students using different browsers should translate actions where appropriate by looking at your own browser’s documentation. Explainer: the evidence for the Tasmanian genocide – Kristyn Harman provides some background to the extermination of indigenous people in Tasmania. Along with the map of genocide, resources like these are central to a call to change Australia Day. In another post on remembering, Louise Raw highlights why Winston Churchill was and is not the saviour of democracy he is sometimes portrayed as. How To Digest Books Above Your “Level” And Increase Your Intelligence – Ryan Halliday says to read above your level you need to ‘read to lead’. This involves ignoring the facts and storyline to focus on the key messages. Reading all of the introductions, prefaces and translators notes as they often provide context to the book. Make notes in books and write out quotes, physically. Apply what you learn. I am not sure I completely agree with everything Halliday suggests, but it does provide a useful provocation to think about the art of reading. For some just reading is what matters. Panicked about Kids Addiction to Tech? 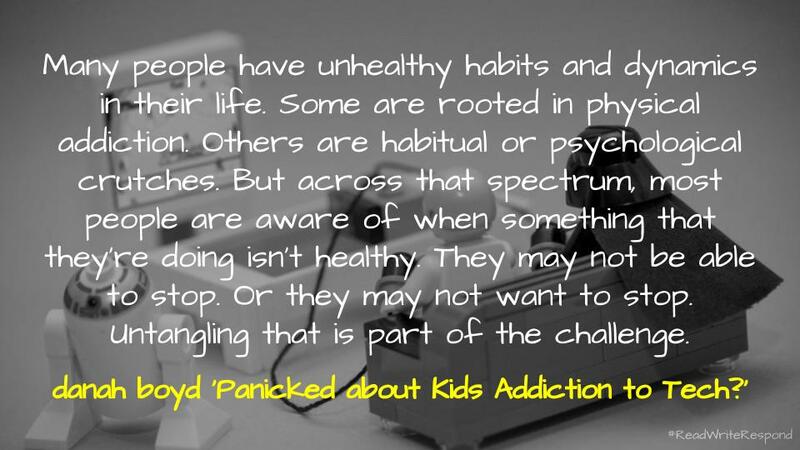 – danah boyd suggests that there is a lot of hype associated with kids addiction. Some of the problems may be associated with parents themselves. In response, she provides two activities for parents: verbalize what you’re doing with your phone and create a household contract. Mitchel Resnick’s provides a different perspective, suggesting time on task is not the problem, it is rather what is done with that time, for Cory Doctorow it is all an arms race focused on control, while Audrey Watters paints her own complicated picture of addiction. Each of these pieces add to a wider dialogue around moderation and other such technical answers currently being suggested as soutions to our digital overload. 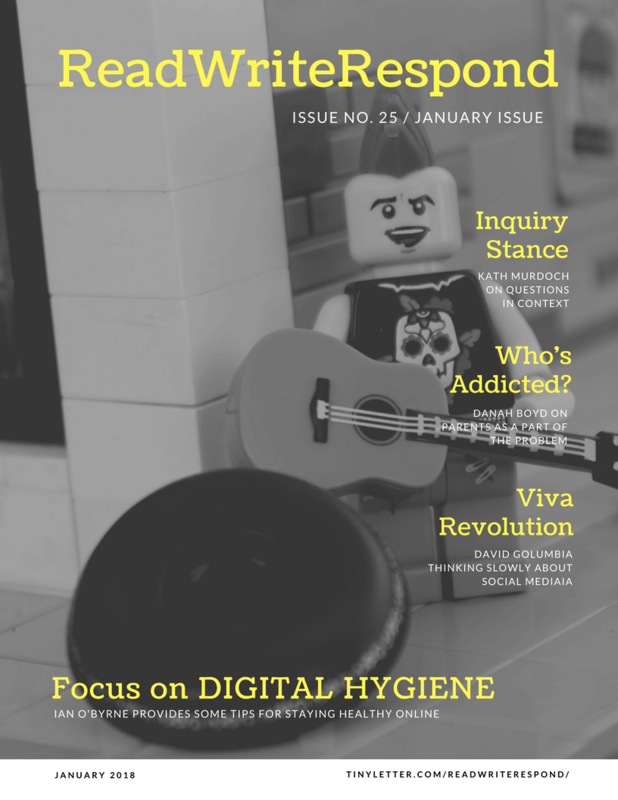 Arguing with the Digital Natives guy in four vexations – David White reflects on a debate with Marc Prensky in which they discussed the future of our digital world. White shares four vexations from the conversation, but the one that stands out to me is his concern about ideas associated with ‘effective and successful’ being separated from a discussion of equality. This links with Alvin Chang’s post looking at school borders and segregation, a topic also discussed on the Have You Heard podcast. It is also interesting to think about this alongside Simon Longstaff’s discussion about the technology and the design of a more ethical future. The human solution to Facebook’s machine-produced problems also won’t work – Responding to Mark Zuckerberg’s ambitious pledge to fix the statistical behaviour-modification machine that is Facebook, Doc Searls explains why Zuckerberg will fail. He suggests that changing facebook is like turning a cruise ship into an aircraft carrier, Searls argues that what has been gained though is a realisation that we all live in the digital world now. It is for this reason that it is important to support children with their online presence and making sense of social media. 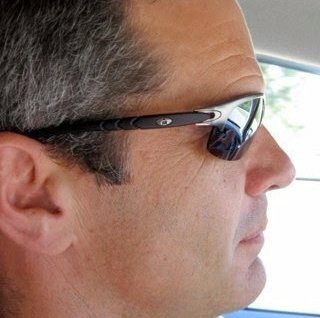 Alternatively, Dave Winer believes that Zuckerberg’s year will be complete once he lets Facebook rejoin the open web. We can only dream. The best thing for Zuck to do is get the hell out, let it finish failing, and start over with something new and better, based on what he and others have learned from the experience. (Which tends to be the best teacher. And hell, he’s still young.) It should help him—and all of us—to know that all companies fail; they just fail faster in Silicon Valley. EdTech Factotum #12 – Clint Lalonde reflects on blockchain. Rather than focusing on whether or not everyone should embrace it, he instead suggests that it is something that we need to be aware of. This is a similar point that Audrey Watters made during Episode 74 of the Contrafabulists podcasts, that it is not necessarily about which technology to choose, but asking why and how things actually work. For more on the blockchain, watch this attempt to explain it to a five year old, read Alex Hern’s analysis of Bitcoin or reflect on Leda Glyptis’ unpopular opinions. Asking why is important and does often get lost in the rush to something new and shiny. But let’s keep asking how as well. In my mind, these are companion questions because, even though you or I may never use blockchain in our day-to-day life, there is a very good chance that it will be used on our behalf in the future. And there is already more than enough unknown technologies running our life right now. Should Your Class Or Student Blogs Be Public Or Private? – Kathleen Morris unpacks the benefits of both private and public blogs. She provides a number of arguments with clear points evidence to clarify her points of view. This is particularly pertinent to schools and educators at the start of the school year. Personally, when I supported classroom blogs they were closed as I was not comfortable everyone who needed to be fully aware of the consequences was. I think though that Kin Lane’s advice on APIs can also be applied, that is, approach everything as if it is public even if it is not. On blogging in general, Chris Aldrich wrote a reply on the potential of blogging as a commonplace book, while Jim Groom suggests that it is an investment in your soul. A dilemma that faces many educators new blogging is the question of whether they should be publishing their students’ information and work online. They might wonder if their class or student blogs should be public for anyone to see, or private for a limited audience (or no one) to view. IRL Podcast – Bot or Not – This episode of In Real Life is dedicated to bots. Along with Crofton Black and Abigail Fielding-Smith’s investigation into the influence of Twitter bots, Kris Shaffer and Bill Fitzgerald’s guide on how to spot a bot, Kin Lane’s reflections on the waves of bots and Nicholas Confessore’s exposé into the follower factory, these resources provide a useful starting point for understanding bots and there implication on society today. From politics to poetry, bots are playing an increasingly visible role in culture. Veronica Belmont investigates the rise of social media bots with Lauren Kunze and Jenn Schiffer. Butter.ai’s Jack Hirsch talks about what happens when your profile is stolen by a political bot. Lisa-Maria Neudert measures how bots influence politics. Ben Nimmo teaches us how to spot and take down bot armies. And Tim Hwang explores how bots can connect us in surprising, and meaningful, new ways. 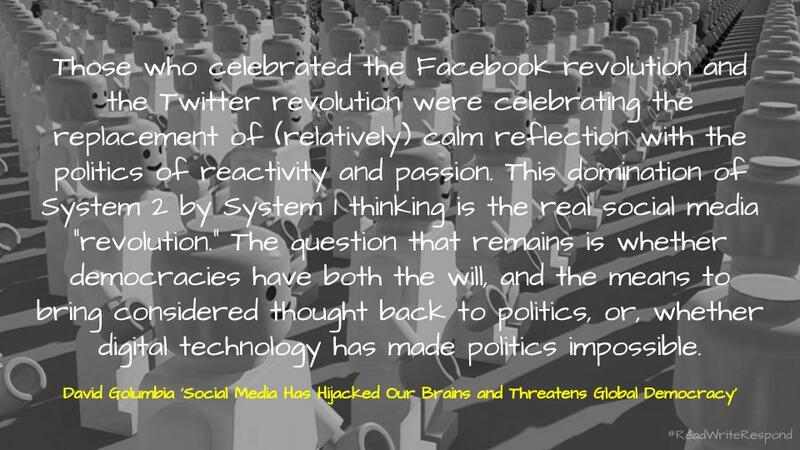 Social Media Has Hijacked Our Brains and Threatens Global Democracy – David Golumbia discusses some of the changes to democracy associated with social media. He argues that we have lost the ability to think slowly, therefore making us more susceptible to irrational decisions. This touches on some of Peter Skillen’s points from a few years ago. Along with Zeynep Tufekei’s concern about free speech and Jordan Erica Webber’s look into micro-targetting, these posts paint a grim view of the future. Facial recognition’s ominous rise: are we going too far too fast? – This is a strange article documenting the rise of NEC. In it, Ben Grubb provides a range of examples, including Crown Casino tracking VIPs and Westfield estimating age, gender and mood. On the one hand, it can be read as being positive – which you would assume as the author’s expenses to iEXPO2017 were paid for by NEC – in that we can now do all these things with technology, but at the same time it asks the question as to whether we ought to? It reminds me in part of the post discussing Hitachi’s use of cameras to improve student life at Curtin University. My question is probably, “why would you?”, as Tony Longstaff warns can does not equal ought. Already facial-recognition technology is being used at Crown Casino in Melbourne to identify VIPs and banned guests. Australian state and federal policing agencies are also deploying it, with South Australia Police using it to identify criminals and to search for missing persons. The best thing ever written about “work-life balance” – Austin Kleon discusses work-life balance. Reflecting on Jocelyn K. Glei’s supercut on the subject, Kleon notes the difference in responses between men and women. For men it is often about creating the write conditions, while for women it is making do with whatever spare moments there are. For the late Ursula K. Le Guin it is not about spare time, but rather occupied time. The Line 6 DL4 Is Quietly the Most Important Guitar Pedal of the Last 20 Years – Dale Eisinger takes a look at the influence of technology on music, in particular the looping pedal. From Radiohead to Battles, Eisinger lists band after band influenced by the features and constraints of the humble pedal. There is a long history of technology influencing music. An example is the BBC documentary Synth Britannia which describes the influence of synthesiers on bands like Depeche Mode and New Order. It is also interesting to think about the DL4 as a ‘non-human’ actor and unpack what this might mean, especially for the modern busker. As technology democratized around the turn of the century, digital audio workstations like Pro Tools revolutionized the home studio, and ultimately changed the course of music with their boundless potential. A less commonly discussed breakthrough of the era involved musicians’ outboard gear, such as guitar pedals, which moved from analog to now-inexpensive digital architectures. Chief among the hardware that benefited from this shift were delay pedals, a class of effect pedal that gives an echo or repeating effect to a sound. Delays were generally expensive, since they required either actual tape loops or expensive memory within their makeup. Digital technology changed that, introducing with it the kind of lower-priced loop pedals that encouraged experimental strains of ’00s indie rockers to recreate with live instruments a similar effect as sampling. There was one pedal in particular that emerged as a favorite: the Line 6 DL4 delay modeler. The Victorian State Education System…from the inside out and the outside in – Former principal of Templestowe College, Peter Hutton, reflects on his connection with the Victorian Department of Education. It is a real insight into a part of education that many teachers never really experience. It will be interesting to see where his ‘EdRevolution’ goes and grows. Unless there are parental complaints, if the school’s numbers are stable or growing and your data is tracking ok, essentially DET allow you to innovate and do as you please. I have loved this level of professional autonomy and dare I say trust shown by DET in its’ Principals. Not really the ogre that people sometimes suspect. In fact many senior staff have provided me with encouragement and professional support during the more innovative years at TC. There are so many posts out there which support users with reviewing their digital presence online. 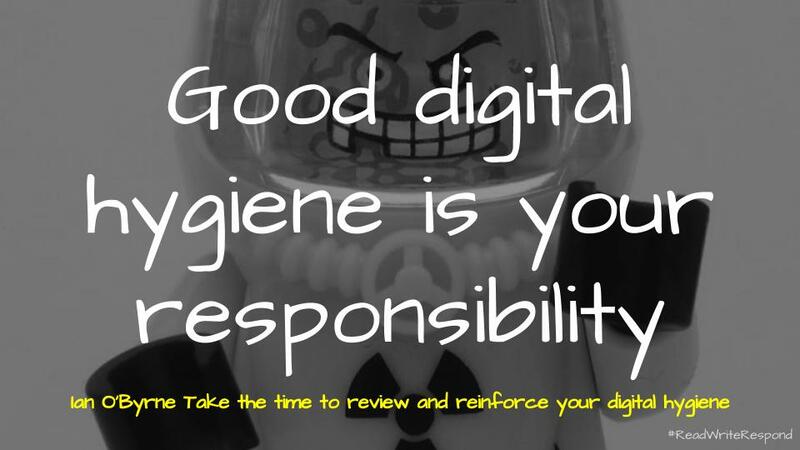 See for example Boost your digital fitness with a data cleanse and Digital Trace Audit: A #clmooc New Year’s ‘Unmake’ Cycle. Ian O’Byrne though has spread his out across the whole month. Unsure which link to include, I have instead provided a summary of all the posts here. I think that the statistics are clear, we could all do more. Understanding the differences between privacy and security – Ian O’Byrne explains how privacy is like closing the curtains or blinds on a window in your house, whereas security is like locking the doors and windows on your house. How to use two factor authentication to protect yourself online – Ian O’Byrne shows how two-factor authentication uses your password to log in to your accounts and services and then requires a a randomly generated (usually) six number key as well. Backup your digital information and devices – Ian O’Byrne talks about the importance of backing up three ways: the original file on your computer, a local backup and a backup in another location. Protect your connection to the Internet – Ian O’Byrne says it is important to maintain an up-to-date router and consider the use of a VPN when using public wifi networks. Encrypt your devices – Ian O’Byrne looks at the options for encryption provided by the popular devices and explains why it is important. So that is MONTH for me, how about you? As always, interested to hear. Also, feel free to forward this on to others if you found anything of interest or maybe you want to subscribe? Otherwise, archives can be found here.